I'm still a little fat kid on the inside…. I live in a city where you can’t walk 5 feet without having some good pizza to eat. Wether you like big sloppy pieces that you could use as a car cover, thick Sicilian pizza, pizza with sauce on the top, the bottom or no sauce at all, crispy wood fire grill type, gas oven type or even little pieces of perfection made in a little South Philly bakery, and anywhere else in between, we got you covered. That’s why I am not a fan of chain pizza. 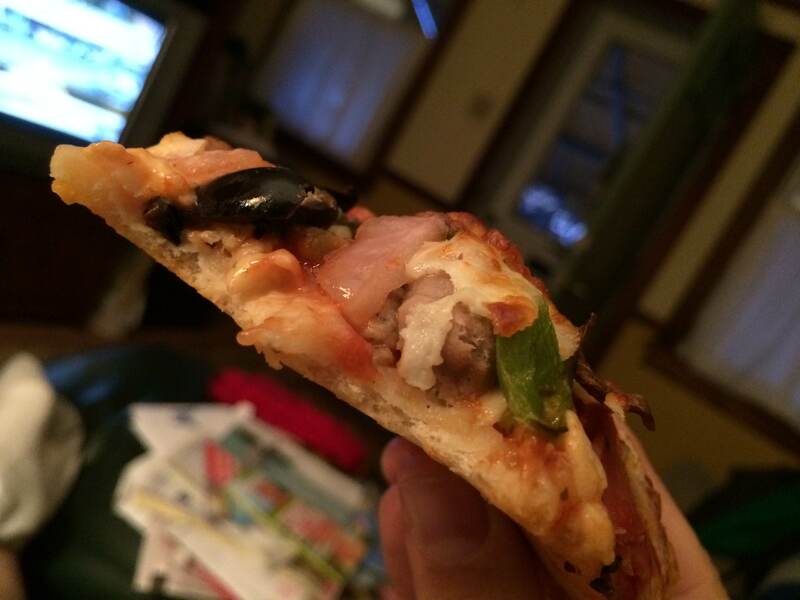 Domino’s and Papa John’s are complete garbage: spongey, overdone crust with salt soaked everything else. Gross. I do have a small spot in my heart for Pizza Hut. When I was a very little kid, my parents and I would drive allllll the way up to the Northeast to eat at a Pizza Hut on the occasional Friday as a special occasion kind of thing. At the time, it was the closest one to our house and I always looked forward to it. Maybe it was because I was allowed to make my own salad at the salad bar (hello, salad mountain!) or maybe because thier buttery crust pizza was just so damn good. It was different from what the local places sold, and that was ok with me, because it was great. Over the years I have scaled back my intake of Pizza Hut, mostly because the grease would tie me up in knots. Also, like I said above, local places were so good, and I always feel good supporting the local guys. A little while back, I signed up for thier email list, mostly because I love the name of it: Hut Lover’s. It makes me giggle, mostly because I am a huge Star Wars Fan. I also do a bit about that in my standup set. But anyway, they were advertising thier new pizza “Hand Tossed” pizza and I felt like maybe this one wouldn’t tie me up in knots. And I was pleasantly surprised! I thought about calling to order and then I remembered they have an iphone app. I opened the app, chose delivery, pay in cash and then not only was I given the choice of the regular pies and packages they offer, they also list, in detail, all thier daily specials. That was pretty awesome! I picked a hand tossed pizza and in the Super Supreme style. It was $11 and $14.58 with tax and delivery charge ($2.50 but the delivery lady was super nice, so I’m not complaining). 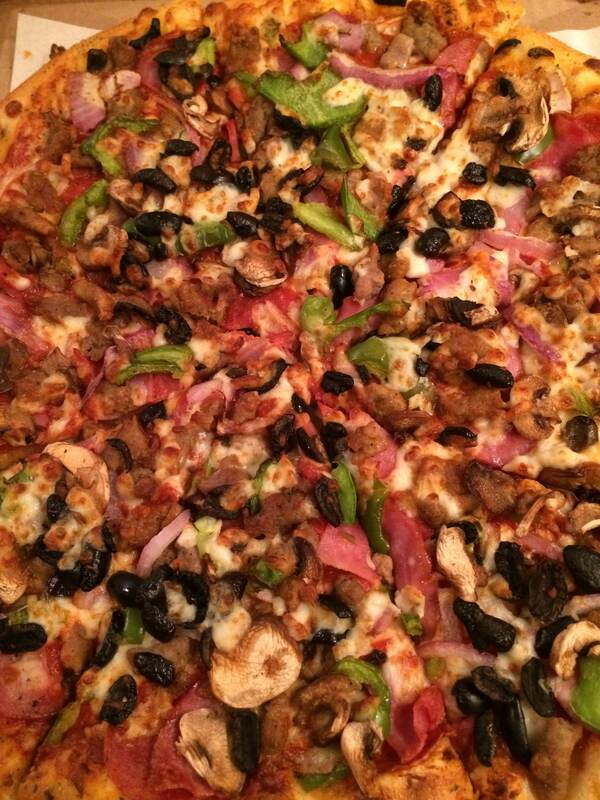 The Super Supreme pizza includes: pepperoni, ham, beef, pork sausage, Italian sausage, red onions, mushrooms, green peppers and black olives. 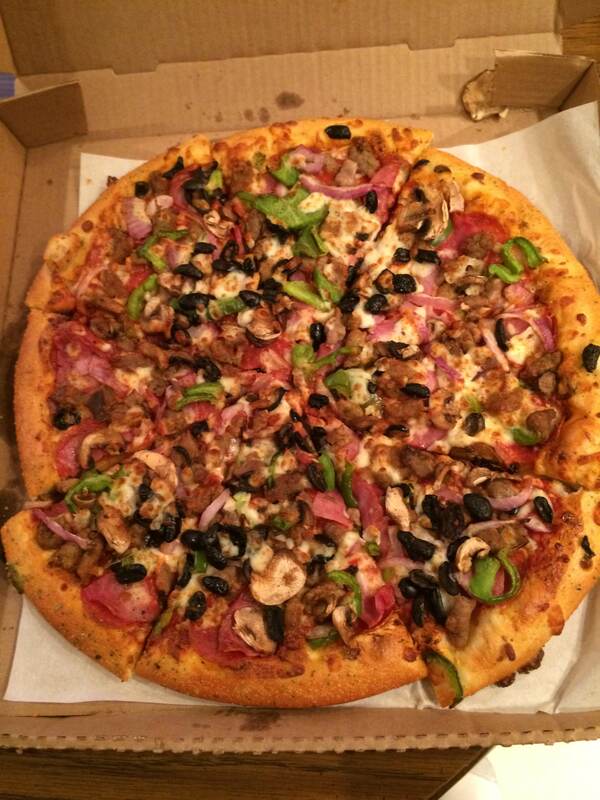 This pizza was LOADED. It only took them a half hour to make it and get it to my door, so it was piping hot, which was nice. Nothing worse then a lukewarm pizza showing up, half congealed. They also were not skimpy on the toppings. Literally in every bite I had at least 4 toppings and the pieces were pretty big. A thing that also used to bug me when eating at Pizza Hut was that I felt like I ate 7,000 tons of salt. But the toppings weren’t salty and neither was the sauce. Over the years, Pizza Hut has tried to examine every section of the pizza, to try and jam more cheese into it. Let’s face it, when your business is pizza, there’s only so much you can do. With this hand tossed pizza, they decided to cover the outside crust with a garlic parmesan shaker coating. Honestly, it’s delicious. It helps with the seasoning of the whole pie and, well, keeps you licking your fingers. A nice touch, I thought, was that when ordering online, they give you the option of skipping the coating if you so chooses. A nice touch for people who might not dig garlic. It shows the gang at Pizza Hut are paying attention. But let’s talk about the crust. This thing is supposedly “hand tossed”. I sincerely doubt that the kids working at The Hut are tossing pizzas into the air, but whatever they are doing, they are doing it right. They are shooting for the local pizza parlor look and style and they have hit it, with a flair all thier own. 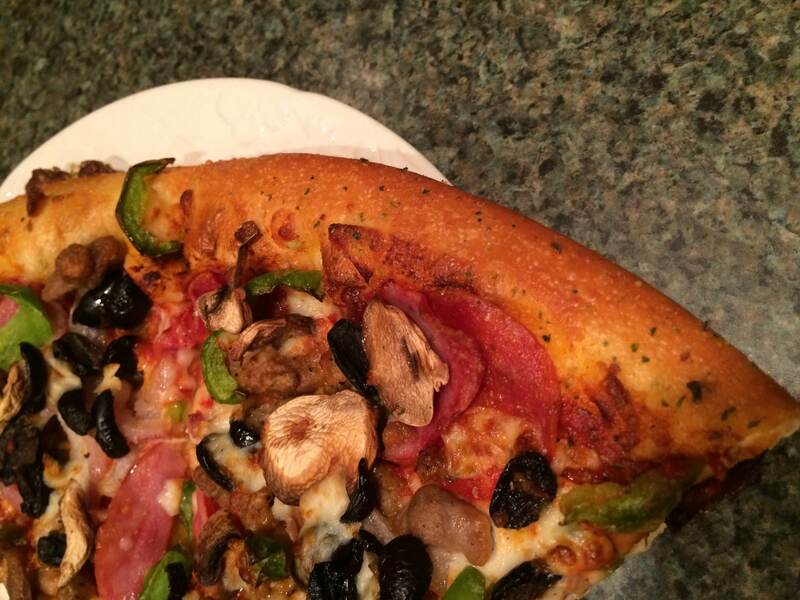 The outside crust is denser then the pan and chewy, without the patented Pizza Hut grease. I mean seriously, this pie is not greasy *at all* beyond the usual pizza grease you’d get because…it’s a pizza. The inside crust is thin and still chewy, but not too thin so that when you pick it up it collapses. You wanna fold it? Go for it (altho the slices are still smaller then a regular pizza place). It is as close to a pizza place then Pizza Hut is going to get. They do it with thier own flair and I have to say, they hit the mark. I feel weird reviewing things without finding something to not like. This might be the first time I like every single thing. The crust is good, the seasoning is good, the toppings were good and even the delivery was prompt and got here right when they said it would. I am sure you mileage may vary depending on where you live, but for a shade under $15 bucks, I was really impressed with this pizza. Hat’s off to Pizza Hut for a really great job.